To get going on a smart home setup, there is no better place to start than with some smart lighting. Your house needs lighting. Voice controlling that lighting is awesome. When you can throw in some fun colors to that lighting, things get even more interesting. 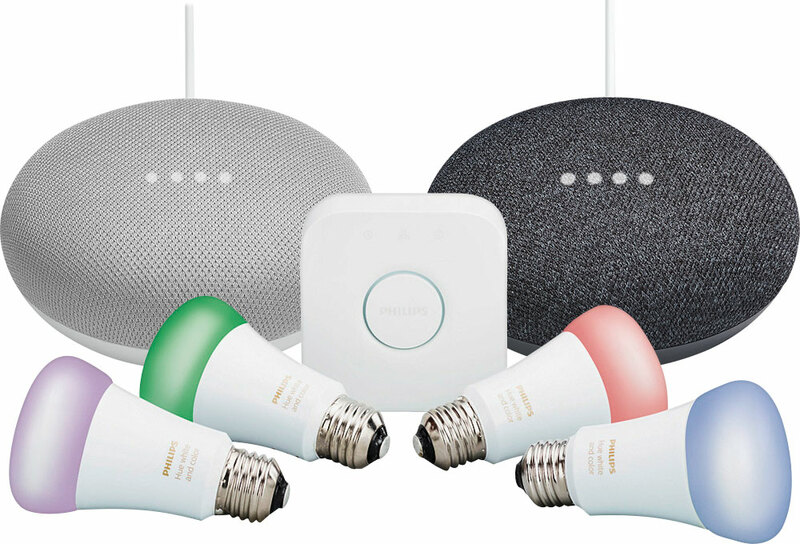 If you want to jump into the world of Philips Hue smart lights, Best Buy is currently running a deal on a Philips Hue Starter Kit that includes four White and Color Ambiance A19 bulbs, plus the hub should you want to add more lights later. It costs $200. However, the deal here is over the included freebies, which amount to two free Google Home Mini units with purchase. Two of ’em! Each Google Home Mini costs $50, so that’s a solid $100 in freebies that give you smart home control by voice when your phone isn’t nearby. They also place music, can tell you about the weather and your day, and recently picked up Google’s Routines feature. To get the deal, you hit that link below and add the Philips Hue kit to cart. It’ll include the Home Minis with it.